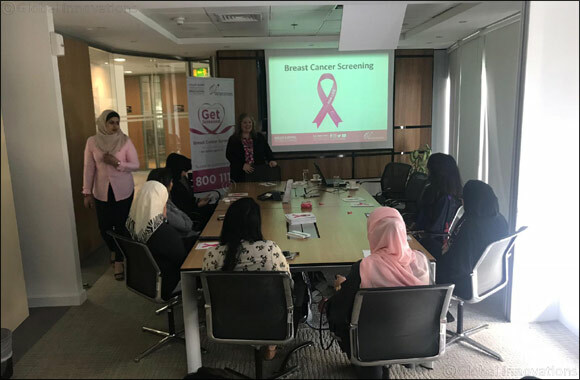 Doha, Qatar – 17 October 2018 – On the occasion of Breast Cancer Awareness Month, Al Khalij Commercial Bank (al khaliji) P.Q.S.C., Qatar’s next generation bank, organized a seminar for its employees in partnership with the National Breast and Bowel Cancer Screening Program ‘Screen for Life’. During this seminar, ‘Screen for Life’ team presented a lecture about breast cancer symptoms, stages and prevention methods, in addition to Mammogram, which is the early detections test every woman between 45-69 should do once every 3 years. The lecture included also details about the suites where women can get screened. Al khaliji was keen to maximize the opportunity for participants of the seminar to gain a wide perspective and promote a message of hope. “Breast cancer takes away so many lives around the world every day. Al khaliji is deeply committed to the well-being of its employees. We are very grateful to have a healthy, strong staff contingent whose fitness is extremely important to us. Most of them leave their families behind in their home countries to come and work with us in Qatar. We feel protective of them and do not wish for anyone in our employ to fall prey to any illness, let alone to a potentially terminal class of disease such as breast cancer. A seminar like this is informative and educational, and will help people to watch out for developing symptoms and to learn about how to treat these diseases, and perhaps to take care of their bodies and lifestyles better,” said Rana Al Assad Head of Personal Banking of al khaliji. Breast Cancer Awareness Month is observed globally in October, as an annual campaign to increase awareness of the disease. The campaign’s mission is to help those affected by breast cancer through early detection, education and support services. al khaliji affirms its commitment to the Bank’s Corporate Social Responsibility through its proactive stance, and contributes to supporting the community through initiatives and campaigns that make a positive impact on the development of society and its welfare.